Total War: Warhammer II’s The Prophet and The Warlock DLC is out now alongside the free Doomsayer update. Among the many tweaks and reworks in that patch is the under-empire mechanic, which I thoroughly enjoy, but which enables you to do some truly dastardly things when paired with Ikit Claw, one of the DLC’s new Legendary Lords. Such escapades gave the developers at Creative Assembly some of their favourite stories from making the DLC. One nasty new tactic is to unleash an upgradeable army of ratmen from beneath an enemy city, taking it by surprise – and battle designer Gary Deans managed to use this vanguard to carve out a new, verminous realm in the heart of the Empire. 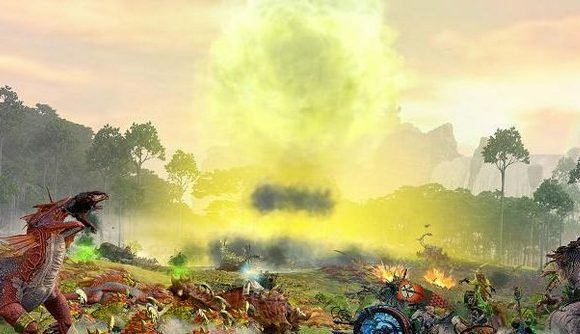 Any Skaven Lord can build a war camp and use it to spawn an under-city army, but Ikit Claw has a unique trick – he can build a Doomsphere. This device, his lifelong obsession, is the Warhammer equivalent of a nuclear bomb, and if detonated successfully, it can reduce a tier-five city to a ruin. You can see Heastie’s story in the video above. If you fancy getting in on the Chaos, the DLC is on Steam here for the reasonable price of $8.99 (£6.99). Head to the Total War blog for Doomsayer update patch notes, including details of the under-empire, Bretonnia’s Mortal Empires rework, Lord Kroak, and rebalances and bug fixes galore.